How to Get the Best Geothermal Heat Pump Prices? Geothermal is just for heating – Wrong! It takes a long time to get back the investment – Not Always! That isn’t always the case at all. Of course, the time it takes to recover the initial investment depends on installation costs, which can vary based on your soil type and other factors endemic to your local environment. It also depends on upon the cost of utilities like electricity. Recouping costs could take as little as four years, or as long as fifteen. Upfront costs are overwhelming – Not Necessarily! While the upfront costs are significantly higher than those of a more traditional HVAC system, there is plenty of help to be found in the form of tax credits. According to the National Renewable Energy Laboratory, residential installation of a geothermal heat pump system allows the homeowner to take the renewable energy tax credit of 30%. If you are in a rural area, or on tribal land, you may even be eligible for a grant or guaranteed loan. A geothermal heat pump consists of three main parts. Ground heat exchanger – This is the matrix of pipes, often called a loop, designed to exchange heat with the underground environment. A water-based fluid is literally pumped into the ground via these pipes. Heat is exchanged underground. After the exchange, the fluid is ready to heat or cool the home. Heat pump unit – This is the unit that takes care of pumping the fluid through the loop. The moving fluid is what allows the system to work in the first place, so it’s a vital piece of the whole system. Air delivery system – this is the ductwork distributing treated air throughout the building. This end of the system is not really different from other HVAC solutions. There are two main types of ground source heat pump systems. One is closed loop, the other is open loop. Open loop systems can only be used in certain circumstances, so closed loop systems are far more common. Closed loop geothermal systems come in a few variations, but the major types are noted here. Horizontal system – The loop (see parts of a geothermal system) is placed six feet under the surface in trenches. This variation of a closed loop system makes use of available real estate by spreading the piping around the property. Keeping the trenches relatively shallow helps to keep the cost of installation down, but it is disruptive to landscaping. Vertical system – For smaller properties, where there simply isn’t enough space for a horizontal system, a vertical loop is installed. This involves placing the loop deep into the ground, with pipes running as far as 400 feet down in multiple places. This variation of closed loop system is more difficult to install. The vertical pipe lengths must be connected at the bottom, 400 feet down. Lake system – In this variation of a closed loop system, instead of burying pipes underground, the system makes use of a natural body of water. The loop is coiled and placed ten feet or more below the surface of the body of water. It has the lowest cost for installation, but there may be environmental concerns. Zoning ordinances, local, state and federal laws should be researched before planning this type of system. There really is only one variation of the open loop system. It’s similar to the lake variation of a closed loop system, but in this case, the actual lake water is used to do the work. Ambient temperature water is pumped into the building for heating or cooling. When the water has been through the system, it is expelled back into the body of water away from the intake. This type of system is not very common because there are not all that many suitable sites where all conditions are met: a large enough body of water close enough in proximity and of suitable depth. Like the lake system above, environmental concerns should be investigated before installation, and the source water must be clean enough to run through the system without much filtration. There’s always the risk of impelling foreign objects and of contaminated water that could produce an undesired build-up of sludge inside the loop pipes. Why should you consider geothermal, and what concerns remain about it? If the pros outweigh the cons in your mind, as they do for many consumers, then let’s continue! Installation Costs Higher purchase cost and installation that often involves significant excavation. Lower purchase and installation costs, particularly when compared to a geothermal system with extensive excavation. Energy Efficiency Very efficient systems measuring as much as 600% efficient and beat air-sourced systems even in the most severe climates. Fairly efficient systems measuring peaking at around 300% efficiency. New variable speed pump motors may improve this rating in the future. Maintenance For the most part, the system remains protected underground or indoors and can last as long as 25 years. Parts of the system are outdoors, exposed to the elements and potential mechanical damage. These systems last as much as 15 years. Space Required Extensive excavation of the property is necessary to install the loop, regardless of whether a vertical or horizontal system is installed. Small footprint similar to a traditional air conditioning system. Tax Credits Geothermal heat pump systems are eligible for a 30% federal tax credit with no limit based on the cost of the system. Federal tax credit is limited to $300. All HVAC systems must be properly sized to the home or building they serve. While a host of factors must be considered as part of a load calculation, we’ve developed a quick way to determine what size geothermal heat pump you might need. 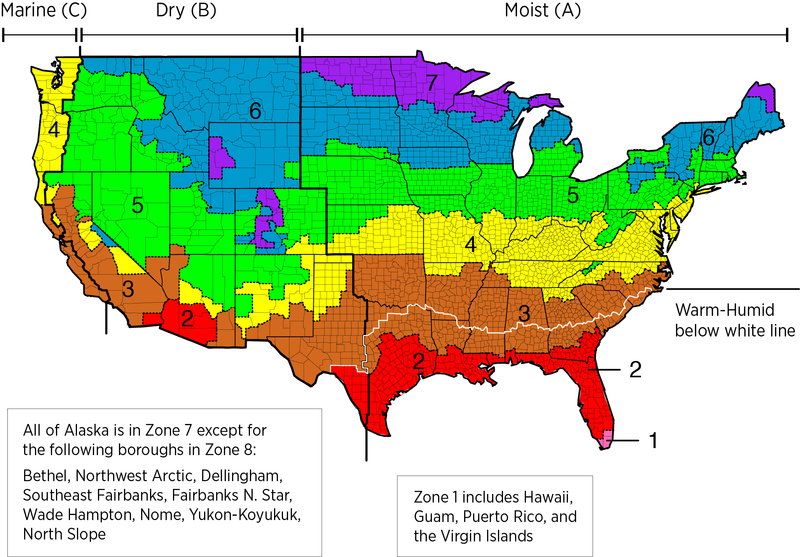 First, find your home or building location on this US Climate Zone map. Zones 1 & 2 (hot): 26-30 Btu/sq. ft. Zone 3 (warm): 22-25 Btu/sq. ft. Zone 4 (moderate): +/- 20 Btu/sq. ft. Zone 5 (cool): 22-25 Btu/sq. ft. Zone 6 & 7 (cold): 26-30 Btu/sq. ft.
As you can see, the more extreme your climate’s temperatures are, either hot or cold, the larger your geothermal heat system should be. A number of factors are involved in the cost to install a new geothermal heat pump solution. These can be split into the indoor and outdoor portions of the system. Retrofitting an existing structure means existing ductwork can either be used, or it must be replaced. Fortunately, existing ductwork is often adequate for geothermal heat pump solutions. If it’s being installed in new construction, then ductwork is required regardless of the kind of heating and cooling solution used. The size of the building will have a major cost impact. Obviously, a larger building requires more heating and cooling capacity than a smaller building. Using multiple zones (for upstairs and downstairs, for example) will increase the complexity and cost of the system. A larger building will require a larger heat pump or additional heat pumps if building multiple zones. Insulation is also a factor. Homes in the southwest are often built to withstand the intense summer heat by locating windows away from the southern exposure. Older homes in some parts of the country are insulation deficient, which will drive up energy demands to keep the building at a controlled temperature. All of this factors into details of the system needed, and thus impacts the cost. The size of the loop field is only one aspect that can drive cost. Obviously, a larger building will require a larger field of buried looping pipes, but climate can also impact cost. Areas like Northern Minnesota, where temperatures can dip well into the sub-zero range for days at a time, will require a larger field than a place like Georgia, where the climate is milder. The same is true about hot climates, like Phoenix, where the high temperature is well over 100 degrees for months at a time. Other factors include soil type. Is your property sitting on rich, loamy soil that’s easy to move, or do the contractors have to punch through a concrete-like layer of caliche? Related to soil type is the orientation of the loop field. A horizontal loop requires trenching of six feet. Vertical loops require excavating as much as 400 feet into the ground, which could prove difficult if digging through a layer of rock is involved. An open loop geothermal system sourcing and sinking from a lake or river, especially for a large commercial or industrial building, could even involve an environmental impact report and other interactions with state and federal authorities. One last factor is the availability of contractors to do the work. If geothermal energy is common in your area, there should be plenty of contractors available to do the work. If it’s uncommon, there might not be much selection, which means the contractors could charge a premium and have a long wait list. The importance of proper installation can’t be overlooked. There’s too much that can go wrong if the crew isn’t experienced. The unit might run inefficiently or be prone to mechanical failure. The loop might fail and lead to expensive repairs or, at the least, a lot of hassle even if fixed under warranty. We recommend getting estimates from several geothermal heat pump system installers in your area. Check their references, and learn about their experience before making the decision who to hire. My wife and I decided to explore cheaper ways to heat and cool our new Michigan home after getting the first month’s heating and electric bill. Upon researching the most viable options, we stumbled upon geothermal heat pumps and after a lot of consideration decided to try a Carrier 3-Ton Indoor Geothermal Heat Pump. Our initial hesitation was largely because of the massive installation fees quoted to us by our HVAC installers (over $20,000) but after he spent a few minutes convincing us how the entire system would basically pay for itself in a few years’ time, we went for it. After 4 days of installation, the heat pump was up and running and already, we could feel the difference. It was much less noisier than we had anticipated, ran without a hitch, and basically took care of all our heating and cooling needs effortlessly. We knew we had made a sound investment when we realized that we were now spending almost a quarter of the original electric bill on both heating and cooling! I have since ordered another unit for my parents’ house in Utah and I intend to recommend it to everyone I know. The installation cost of my 2-stage Climatemaster 3-ton Geothermal Heat pump was exorbitantly high, to say the least. Two months in, however, I am still very impressed by the efficiency of the unit, how well it runs, and how much money it has saved me thus far. My Florida home used to cost me thousands of dollars in cooling costs every year and now, all I have to worry about is the few hundred bucks I have to pay for electricity. As for the unit itself, it was installed well enough and it pretty much runs without needing a lot of constant care, which is something I like since I’m a busy man. So far, I’m not sure I would recommend it just yet, mainly because it costs an arm and leg to install, but I am confident that after this month’s electricity bill shows me just how much money I was wasting previously, I will be singing about it in the streets. Great buy! The HVAC unit in my holiday home down in Alaska broke down spectacularly one winter and we had to cut our holiday short or freeze to death. Afterward, I looked into geothermal heat pumps as a more permanent solution and also because I had heard that they were less prone to catastrophic failures. A bit of browsing landed us on the 2-Stage Bosch 4-ton Geothermal Heat Pump, which was perfect for my house. A year after installation, I was so surprised to find that the unit was running as good as new and as noiselessly as I expected. All it had received were a couple of maintenance checks during the year which was necessary since we only spend time there during the holidays. The dehumidifier works excellently and makes the house more bearable to be during the warmer days. I would absolutely recommend this to anyone looking for a cheaper alternative for heating and cooling their homes. Our 4-ton GeoCool geothermal heat pump was installed over a year ago and so far there is little to complain about. We’ve only had to call in our HVAC technicians for a maintenance job once when there was a strange noise coming from the pump. Turns out some parts in the compressor had come loose, which was indicative of either a shoddy installation job or poor build quality (we’re hoping it’s the first one. We haven’t had any problems since. After getting over the high installation costs (we had ours installed using the vertical system, which is considerably more expensive but also a much more efficient option), the system works like a charm. It’s been 7 months since we bought and it hasn’t had any major malfunctions with either the system or any of its components. We look forward to recommending it to our friends since it is very cost-effective in the long run. Our 2,200ft home is right next to Lake Superior, which is why we decided to go for a lake-based installation for our Carrier 17.1 Seer geothermal heat pump system. We have never looked back since, especially because this is more efficient than our previous HVAC system, not to mention a lot more cost effective. Repairs have been few and far between during the 8 month period since we installed it and only because there had been some issues with the pipe installation. We are currently looking into other models for our second home in Illinois but we would recommend this to anyone looking for cheaper ways to heat and cool their homes. Thirdly, ask for at least 3 bids before you make the decision. You can click here to get 3 free estimates fo your local contractor, and this estimate already takes rebates and tax credit into consideration and filter unqualified contractors automatically. Find further information on geothermal heat pumps by visiting any of the following pages. National Renewable Energy Laboratory– Good information on federal policies, including tax credits and eligibility for grants and loans. Also, a table listing state policies. Use this page to determine whether any additional savings are available in your state for geothermal solutions. The page also includes information on other energy sources, like solar and wind power. S. Department of Energy– This site is a good primer on geothermal heat pump basics. Energy Star– This site provides an overview of geothermal heat pumps, specifications, and buying guidance. Information on requirements to qualify for a federal tax credit can be found here. The Environmental Protection Agency’s lengthy report on Advanced Residential Space Conditioning Technologies (including geothermal) is found here and can be exported into a PDF document. Interested in other efficient systems? Read our most efficient heating system and most efficient air conditioner guide here. I think you are absolutely right. I bought my equip over internet which was a mistake, but there were no geo installers and I didn’t know any suppliers. “Designer’s” system I think is too small, was more expensive then I could have bought it for, didn’t ship what I paid for, sent unused plastic fittings, thermostats, etc items, and specified an 80 gallon hot water heater for a buffer tank. B & D mfg in Shannon Ia, sized a 30 gallon real buffer tank. Why heat all that water?? a hot water heater has one 3/4 inch supply while a regular buffer tank has a lot more supply for your in floor pipes. My installation took me about 3 months. I went lateral loops. Total cost was about 18K; 3T climatemaster. 30 gal B & D buffer tank and 2 motor flow centr I used brass fittings; supplies about 3K. Forget warning about not “obstructing” pipes by using barbed fittings. I had to because compression elbows leaked. If I had not followed You tube demo about pipes through wall, compression elbows could have worked. My system works good after I got it running. I’m 77 and building 3600 sf concrete house with brick and marble exterior myself. You may have to have wells drilled, but you can do it yourself. I had never seen a Geo installation before.